At Vibes, we offer a cool system that lets our customers display interactive, SMS-driven visualizations on large screens in front of an audience. To control these visualizations (I’ll post some examples later), we built a remote controller. 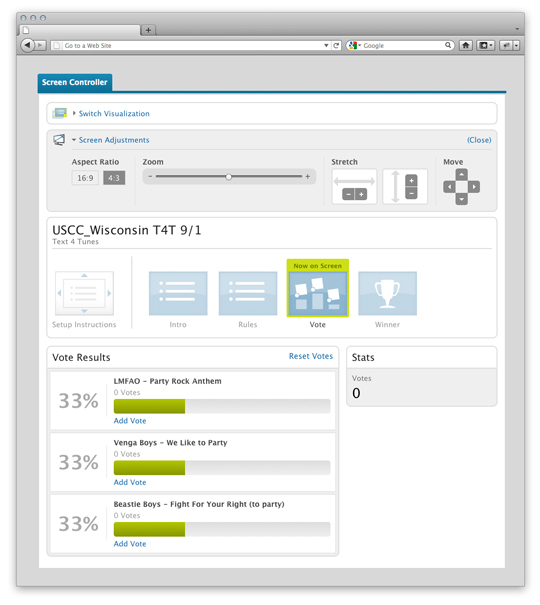 The controller lets users select the visualization they want to show, configure it to fit the screen they’re displaying it on, and control what’s being shown on the screen. The controller below controls a vote visualization. People at the venue text in to choose the next song they want to hear. The remote controller shows the state of the visualization (currently displaying the vote options) as well as the number of votes received. When time is up, the person in charge of the clicks the Winner screen to display the vote winner to the audience. When the user selects a visualization, the remote controller and popup appear. 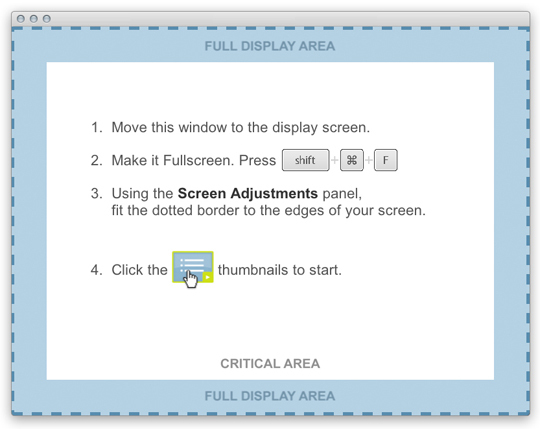 To put the visualization up on the large venue screen, the user follows the instructions on the popup. When the visualization popup is put into fullscreen mode, it automatically resizes it’s contents to best fit the available screen real estate. The screen adjustment controls in the remote controller help fine-tune the display and when everything looks correctly positioned the visualization can begin.